The holiest of weeks in the Christian year is behind us. We've journeyed to the cross, entered the anguish of Christ's suffering and celebrated his resurrection. Easter is over but our new life in Christ lives on. 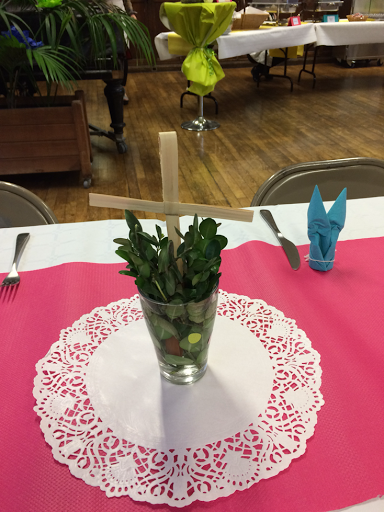 Easter at ACP was one that we will remember for the rest of our days. 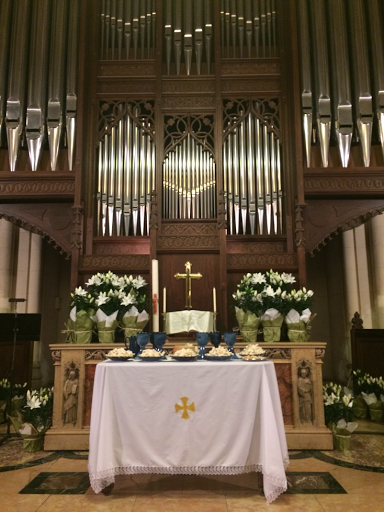 Services each night of holy week prepared us well for a weekend of meaningful worship culminating with an Easter day celebration that brought great joy and meaning to the day. 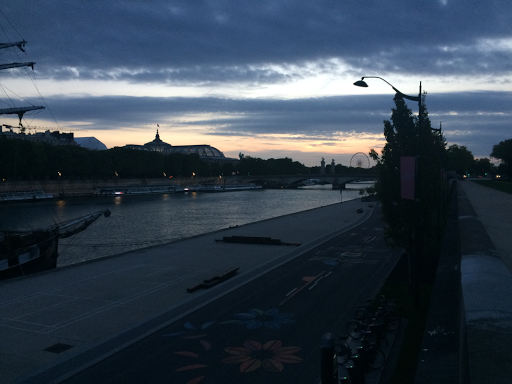 It all started at 7.00am on the quai across the street from the church with a sunrise service. 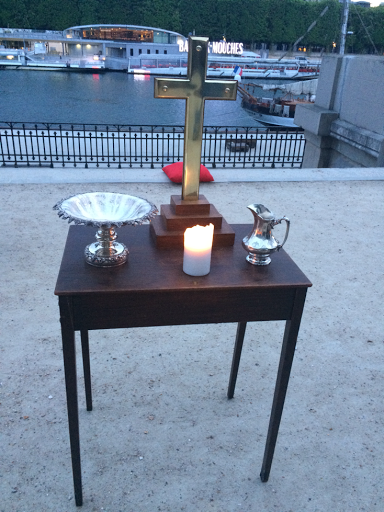 It was a chilly but beautiful morning and it was a delight to watch people gather as we sang, heard the Easter sermon of St. John of Chrysostom read, and participated in the baptism of 3 people. What a way to begin the Easter celebrations! 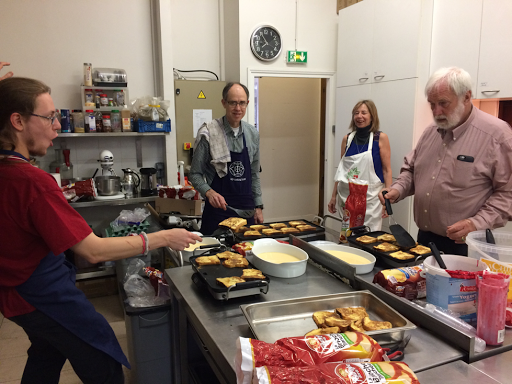 We were all ready for some warming up and a beautiful breakfast awaited us in one of the fellowship rooms. 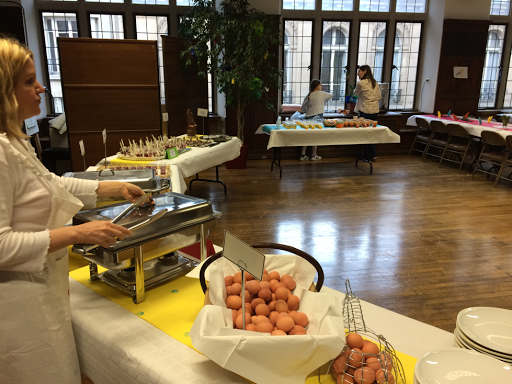 The community life group really outdid themselves in getting things ready for this beautiful Easter breakfast. 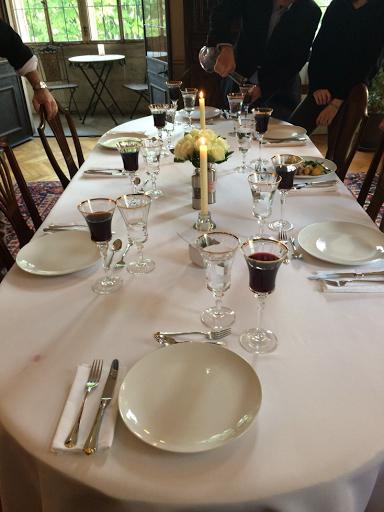 Soon it was time to begin the 9.00 service. The prelude featured three soloists singing pieces from Handel's Messiah. I was on the platform at the time so was lucky enough to be up close and personal when the soloist and trumpter played The Trumpets will Sound. It was so powerful and moving. 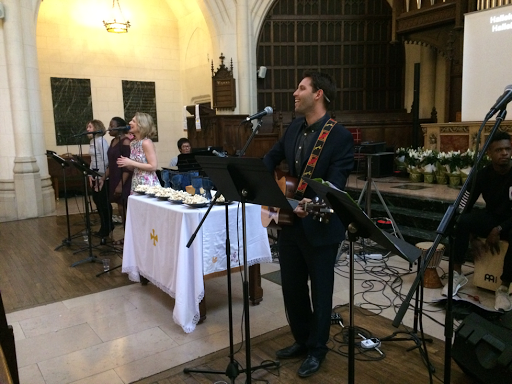 I had no trouble being excited to stand and welcome people to worship with the words "Christ is Risen". The entire service got better and better with each element. The opening hymn was a blend of Jesus Christ is Risen Today and Thine is the Glory, a beautiful arrangement that the talented musical director put together. 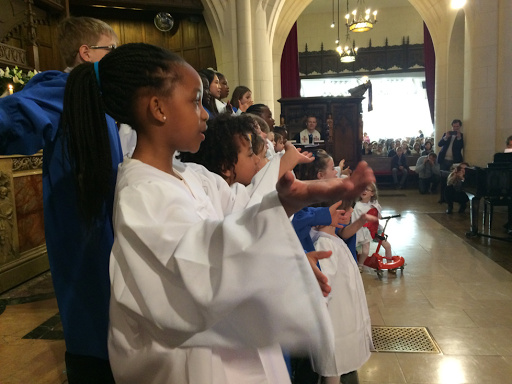 There were handbells and brass, choral music and a kids choir, all of it bringing praise and glory to our resurrected Lord. 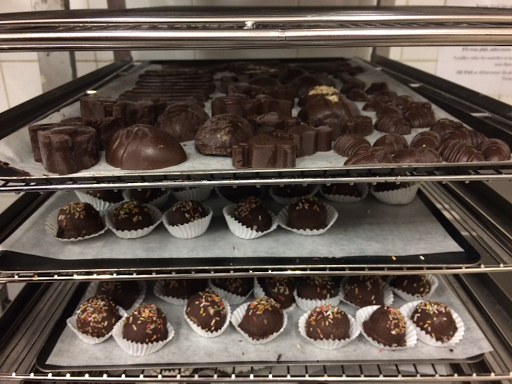 These are the days when you are so happy that you get to do the service again! A mere 30 minutes separated the end of the first service and the start of the second. It was equally as joyous the second time around! There was a bit more time between the end of the 11.00 service and the start of the 1.30 contemporary service. What fun to see the transition in style with yet another full sanctuary. Finally at about 3.00pm the worship services had ended and there was time for a cup of coffee with church members and friends. What a day! So memorable and so meaningful. 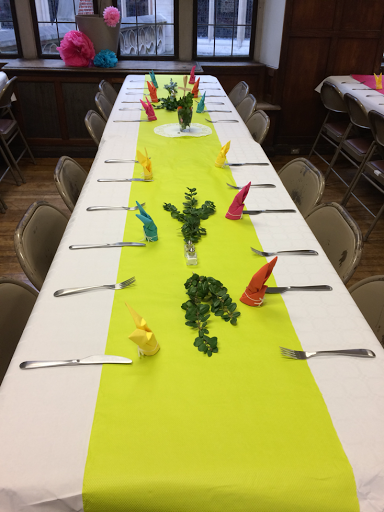 That evening we were invited to join the senior pastor, his wife and two kids along with another couple for a fantastic Easter dinner. The meal was just perfect and beautiful in every possible way. The company was lovely as we relaxed and reflected on life and friendship. It is a true gift for us to spend this abiding time with Kim and Scott, long time friends through International minstry. It was great to connect with the 2 kids they have at home right now as well since we don't get to see a great deal of them due to the demands of their school schedules. 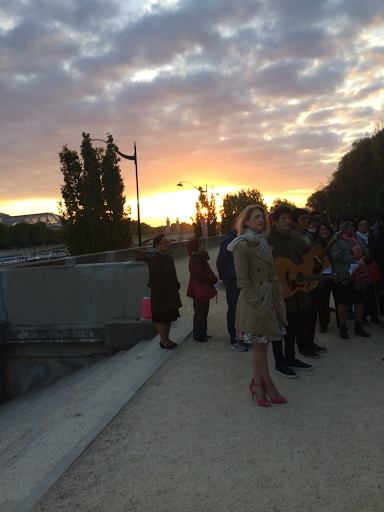 They indulged our desire to hear them play guitar and sing towards the end of the evening. So much fun! 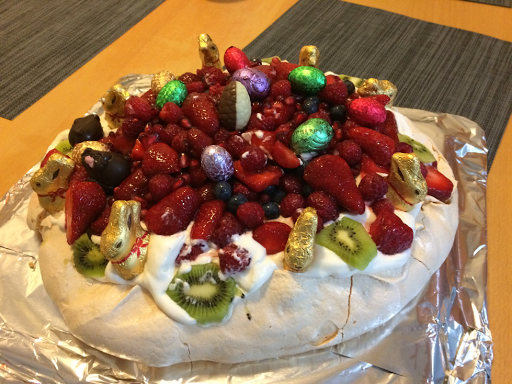 For some time now I have made pavlova for an Easter dessert and it was great fun to put it together this year and serve it up. It turned out really well and we managed to eat most of it! 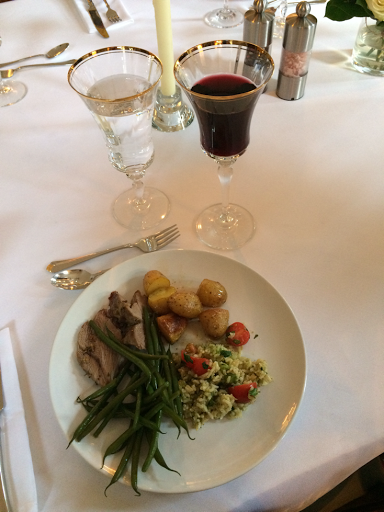 There was no shortage of good food and drink on Easter. 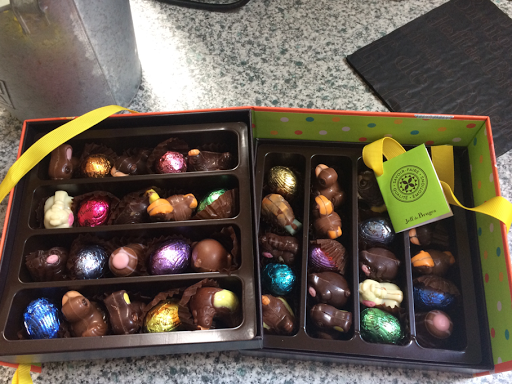 Friends who were with us Saturday night brought us the most elegant, adorable box of delicious Easter chocolates. It is almost too pretty to eat. (Note how I said 'almost'). The box itself was really cool with the top shelf sliding out to reveal an ever more delicious second layer of yumminess. Easter Monday was a day of rest for us as I'm sure it was for most pastors. It was a public holiday here in France so it was quiet in the church and in our neighborhood. The joy of the day lingers for sure. 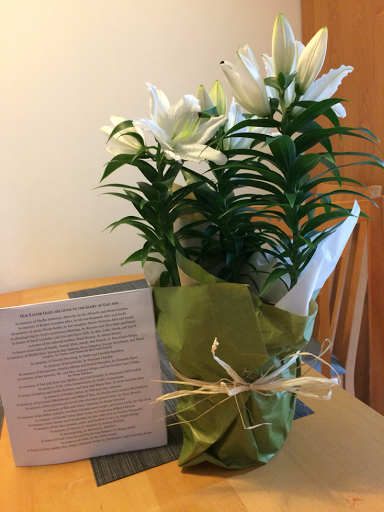 And the beautiful Easter lily that we purchased in memory of my parents and Doug's father now adorns our home. The fragrance and beauty of the plant remind us of the joyous promise of the resurrection, that death does not have the final victory. 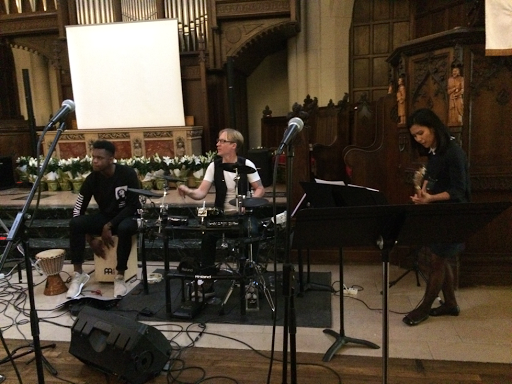 We miss our loved ones during these high holy days, but we remain thankful for the joy of this church, the ministry that unfolds in this place, the creative energy that leads people in worship and draws them ever closer to the joy of life in Christ, our resurrected Lord. Thanks be to God for his marvelous gifts.